After I found this rock it needed to be completely scrubbed and washed. When it was dry, I used wood filler to fill up any cracks or imperfections that could get in the way of painting. When the wood putty was dry, I sanded it smooth, and the rock was ready for the base coat. This large rock has a nice flat base so it stands up nicely. 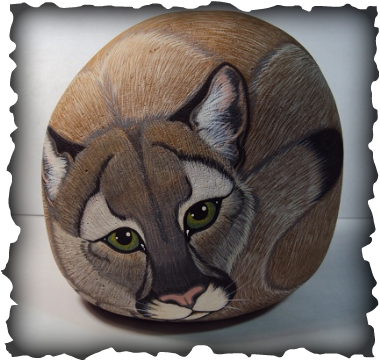 Perfect for a mountain lion rock. 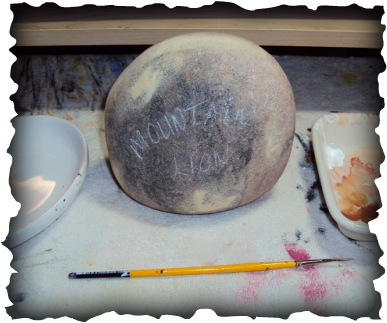 The first step is painting the base color on the rock. I chose a yellowish-brown. I mix a lot of my own colors to get just the right color I want. I use fast drying acrylic paints that you can find anywhere. 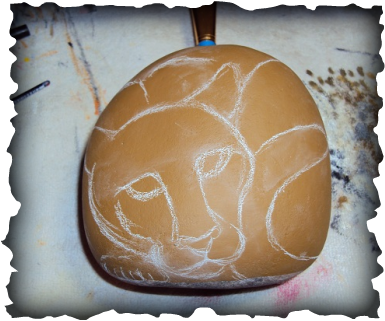 Next, I did the basic outline of the mountain lion with a white chalk pencil. The marks wash away with just a little water and a dab of a towel. It works really well as I sketch to get things just right before painting. Here I have started on the face using different shades of grey, and a cream color on the chin and above the mouth, a pink nose with solid black coming down below the nose on both sides down to the mouth. The eyes have a minty green colored base outlined in black. More work will go into the eyes later. Now the face is really taking shape. Using the smallest of liner brushes that I have, I make each and every hair with short strokes. There are literally thousands of brush strokes that go into the painting of the fur. The eyes are starting to come alive with with hints of yellow and green around the black iris. The eyes are the most important part of every animal I paint and really make the painting come to life. 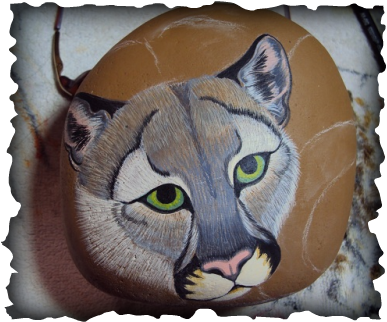 and painting the whiskers, it is finally finished. The very last steps are to sign the bottom of the rock and spray the rock with a protective sealant. The process on each rock, no matter how big or small gets special attention to detail. 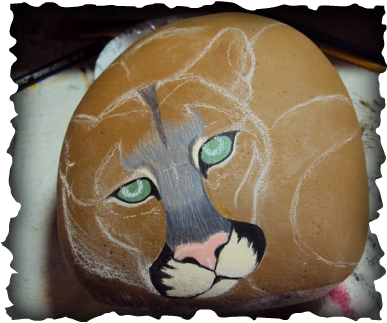 It takes time to find the rocks, patience to paint them, and the love of animals for me to do each project. I want each customer to be completely satisfied when their special rock arrives at their door. They are a great gift for yourself or someone you know, and one-of-a-kind. They also look nice laying on a pillow, in a basket, or a favorite spot in your home. Check out my "What I'm Doing This Month" blog to see what I'm working on.